DC’s remix of Mattel’s classic property has recently received a lot of love from fans and critics, including the SpartanNerd. However, this time, I don’t feel as good. In issue #5, The Goddess/Sorceress/Teela reveals that destiny has three faces…Serpos, Zoar, and Horokoth. Serpos was the ancient god of the snake-men. Zoar has been Serpos’ replacement for ages for the Eternians, and Horokoth a god for the Horde. The Goddess thinks the Age of Horokoth is inevitable, and wonders if He-Man could, or even should prevent it. 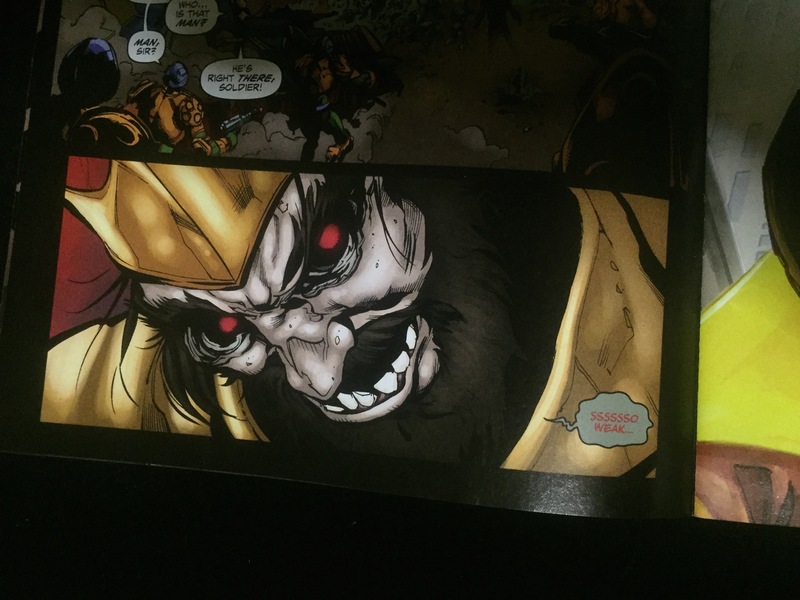 Issue #6 shows us a dystopian future where Adam becomes King He-Man, and rules with an iron fist. 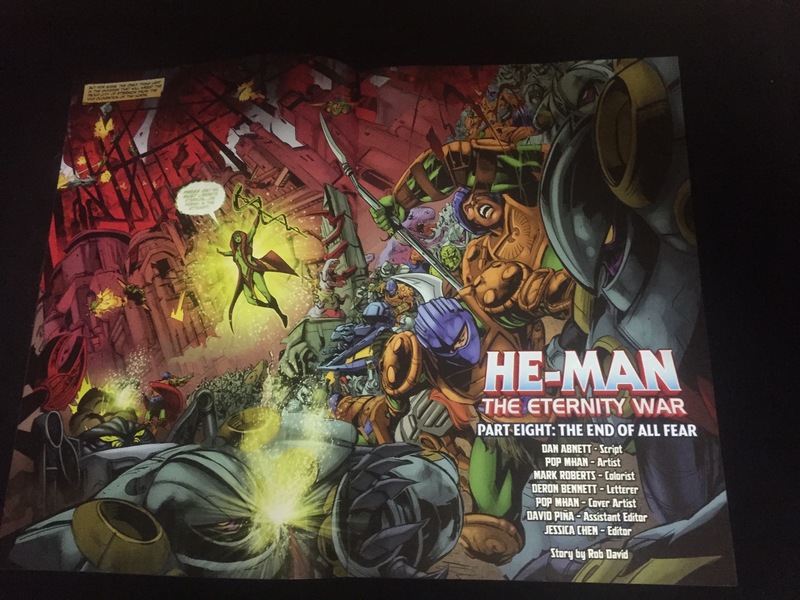 He has enlisted his former enemies, Skeletor’s minions, to be a big part of his army, and is fighting against She-Ra, who leads the former Masters of the Universe as rebels against him. We see him married to Teela, who reverts to green Goddess mode and we realize it was a vision given to Adam of what the future is to become if He-Man beats back the Horde himself. So He-Man breaks the sword! Issue #7 is more back-story for Skeletor and the Havoc Staff. Evidently, strangely, Skeletor became the Evil Overlord of Destruction by breaking the time-space continuum and preventing his own murder at Hordak’s hands…an event that had to happen because the skull on the Havoc Staff is his own skull, only twisted by demonic magic. Skeletor also tells us that he helped raise Despara/Adora/She-Ra, but because it is Skeletor who is talking, who knows if he’s telling the truth? 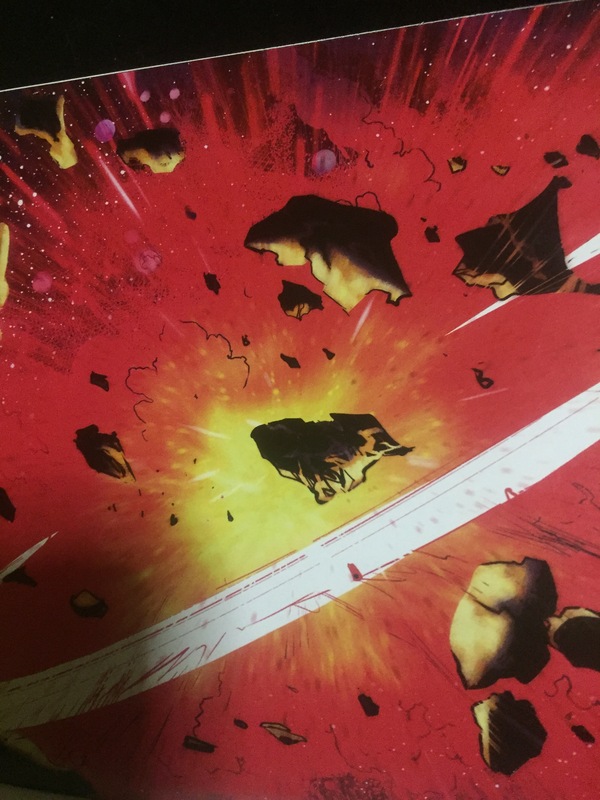 After all of these exciting stories, we get issue #8. A break in the jaw-dropping revelations. We get some fighting and some narrative in the first few pages. We see Adam leading the charge with a gun-arm reminiscent of what Man-At-Arms uses. Basically, just one day after the war, and the snake-men seem less loyal to Adam. They were showing astonishing loyalty to He-Man. Now, not so much. Fisto has to call down this snake man who is about to execute Imp. Evidently, the snake men are supposed to know that prisoners are to stand trial. Adam is catching cold. The Goddess thanks him for relinquishing his power. I didn’t photograph the next parts, but here is a summary. Skeletor turns on She-Ra like we all knew he would. 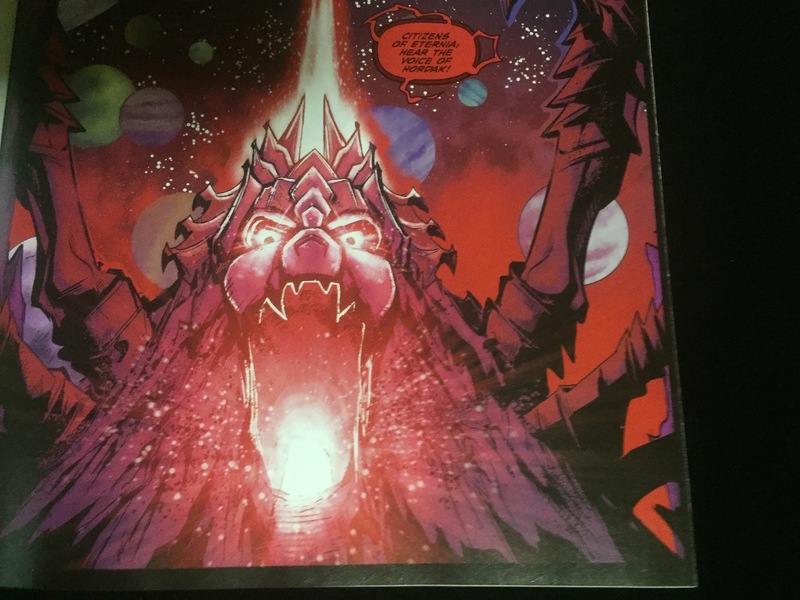 They transport into Hordak;s “Vault of Souls,” where he steals most of the souls, and then entices She-Ra to fall into the vault by throwing a locket with Marlena’s picture into it. Act III…, Hordak finally makes his intentions known. The Eternians have one day of peace granted by him, (I guess because he’s such a nice guy.) 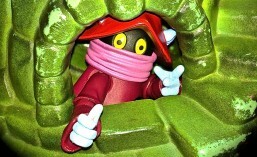 Next he shows the future of those who are going to escape him to the planet Primus. And destroys their future lives and their offsprings lives on Primus. Wait another month, fools, for the next installment. My quandary with this book comes in several ways. First of all, why was King Hsss there? Is he making the snake men less loyal? Did Adam meet him in battle? All we get is a strange picture of him saying “sssso weak,” referring to Adam. 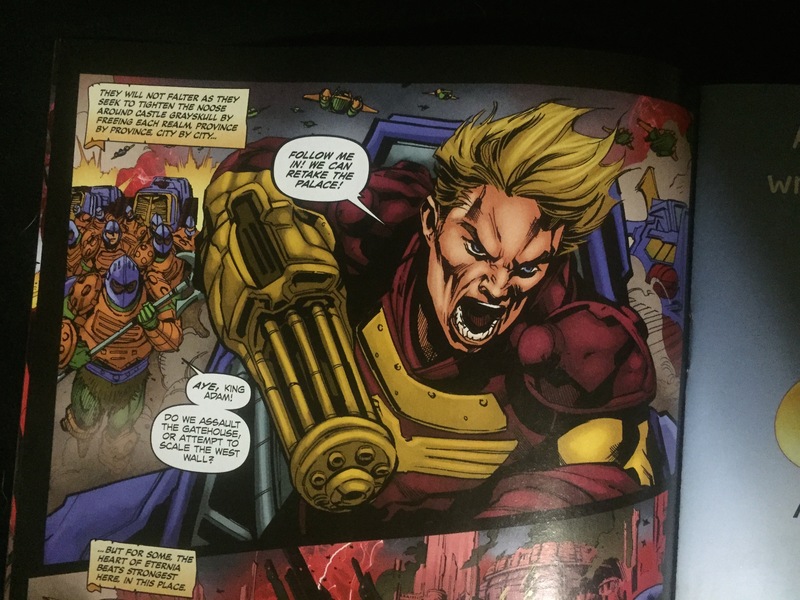 My next problem is…we didn’t see HOW Adam led them to defeat the Horde at Eternos Palace. All we get is “The day after liberation.” A whole book could have been devoted to just that. And SHOULD HAVE. We would have seen Adam as the strong leader he evidently is, apart from the Power of Grayskull. But the writers took the lame way out. “The next day…” “The day after Liberation,” “After the battle.” But we see none of the action. And action is one of the reasons why I like comic books. BOOOOO!!!! And just think how much more the rest of the story elements in this book would have meant? 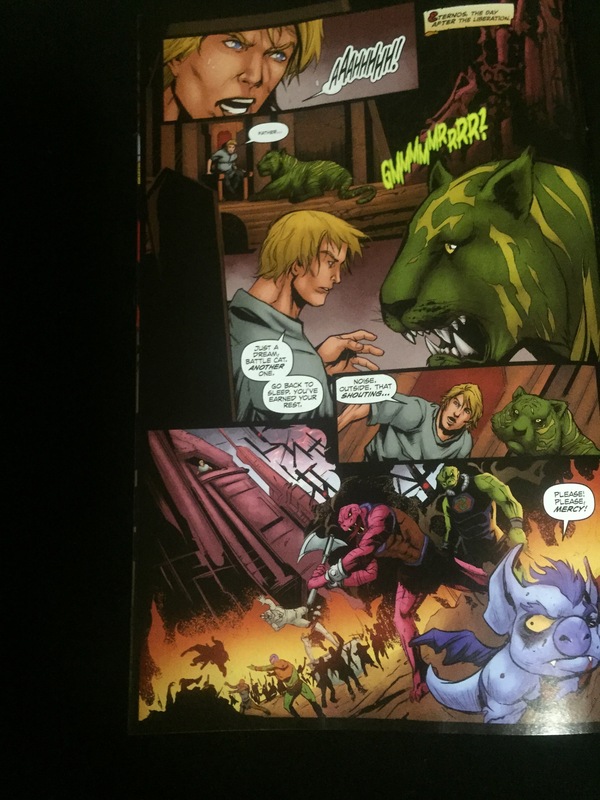 My fourth gripe…New Adventures never does seem to be able to get ahead, does it. I never watched the show, but read the few mini comics that were printed. My brother had Slush Head and New Adventures He-Man. I myself am not completely unattached, and hope the best for New Adventures because there are hundreds of fans. But those fans just got dumped on. Hordak destroyed Primus. And we just got to see it in one panel! We could see it, and the future Masters of the Universe, who were also evidently destroyed. Oh Hub City Geeks, I believe this comic was necessary for the advacement of the story. But there are many things wrong here. I hope things don’t turn south from here on out. The only redeeming quality here is the art, which is consistent with the better art printed in DC’s run of Masters of the Universe. 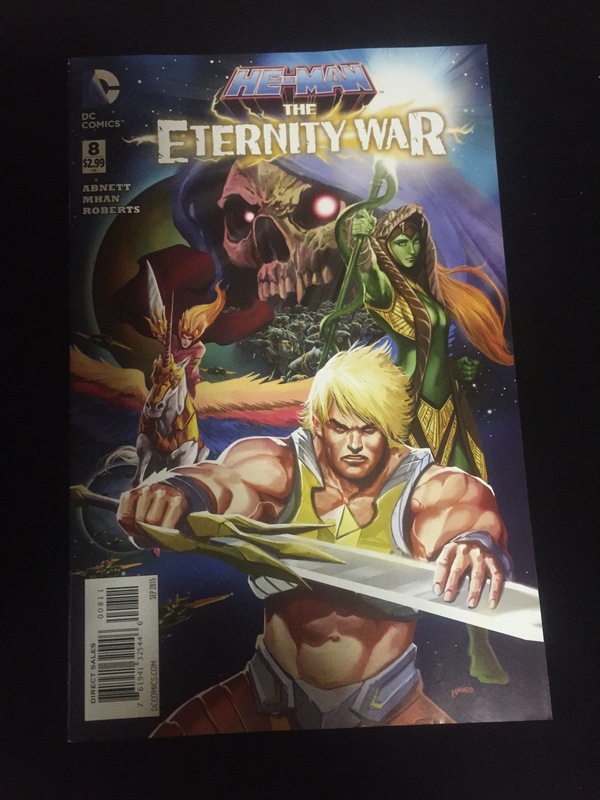 The SpartanNerd rates He-Man: The Eternity War #8 a 1/5. This is one of the lowest scores I have given a modern comic. It is a necessary read to have the story. But pitiful delivery.